Excellent fine art posters from Star Trek: The Original Series! Beautiful retro-style posters from TOS episodes 9, 28, 53, and 75. Highly limited to just a single run of printings! 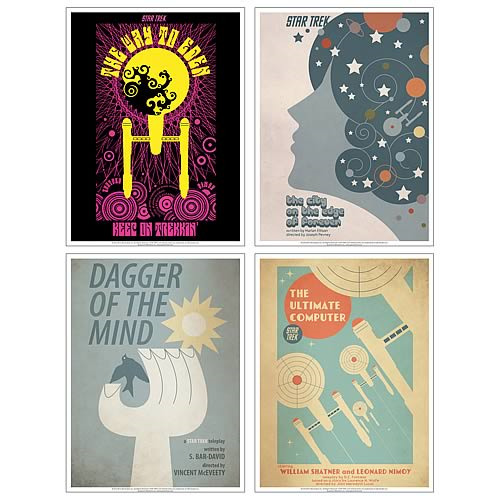 This Star Trek The Original Series Fine Art Poster Set 1 is an amazing set of fine art posters that true fans of Star Trek: The Original Series television show simply cannot do without. Set 1 of the retro-style Star Trek: The Original Series fine art posters features 4 posters from TOS episodes 9 "Dagger of the Mind," episode 28 "City on the Edge of Forever," episode 53 "The Ultimate Computer," and episode 75 "The Way to Eden." This is the first set in a line of retro-style art prints by artist Juan Ortiz that all take inspiration from The Original Series. There is a poster for every episode of the original Star Trek television series, including the first pilot, making 80 in all. Collect them all! Each print measures 24-inches tall x 18-inches wide and is limited to a single run only.